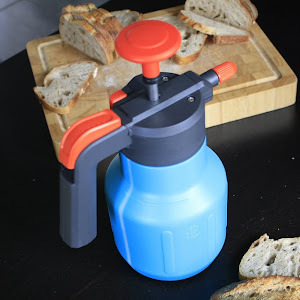 Hoe gebruik en lees ik een recept? Is het ene brood wel gezonder dan het andere? 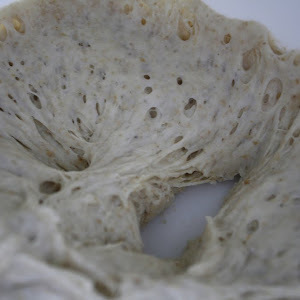 A “bâtard en levain”, with an exceptional crust. What could possibly be a better introduction than a closeup of a bâtard with a nice “ear“, inviting you to tear up and feast upon? 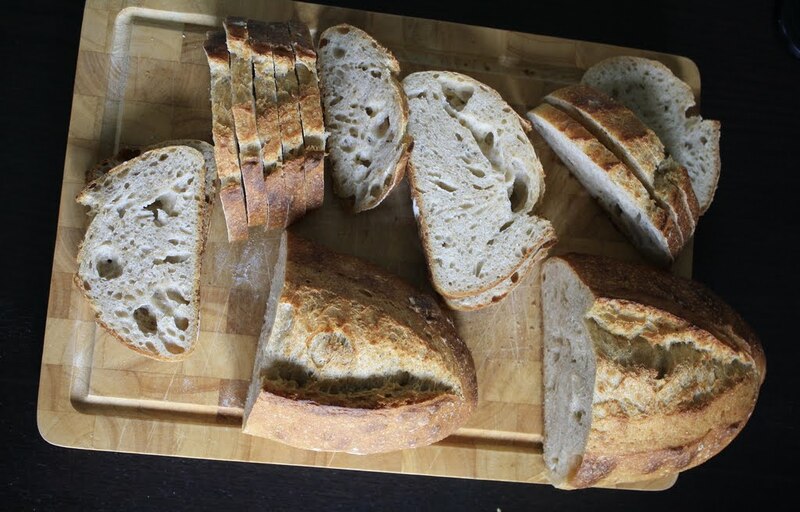 French country bread is so rewarding and so easy to make, it’s a shame I did not try something like this before! 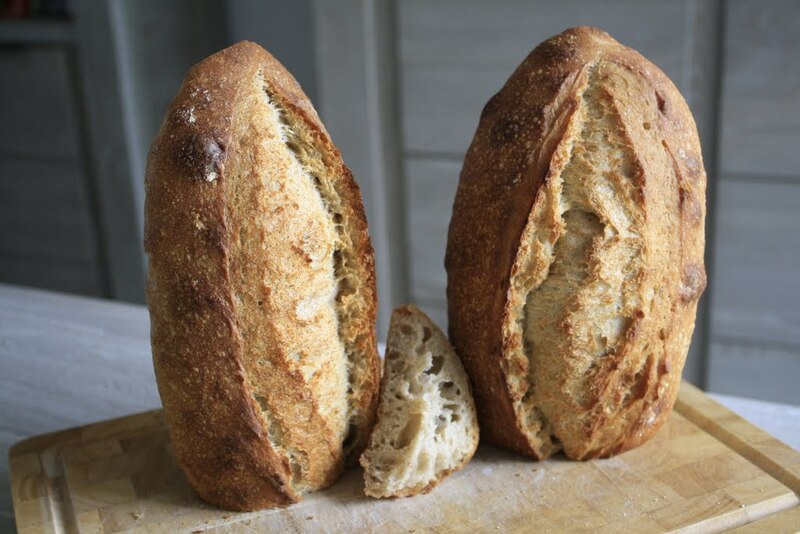 Although my daily bread is inspired by Vermont Sourdough and Pain au Levain recipes from Mr. Hamelman, this recipe comes from Mr. Leader’s “local breads” book. There are slight differences noticeable but the core remains the same. 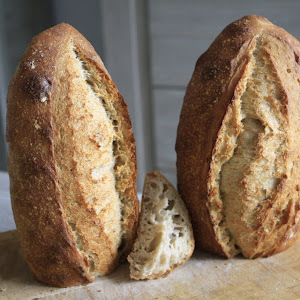 I’ve used a stiff levain this time, the “most traditional” French recipe. 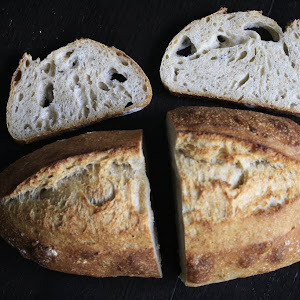 Hamelman uses a liquid levain at 125% (but I used 100%). Right now, I converted the liquid one to a stiff one. Instead of stretch & fold-ing, Mr. Leader calls it “turning the dough“. 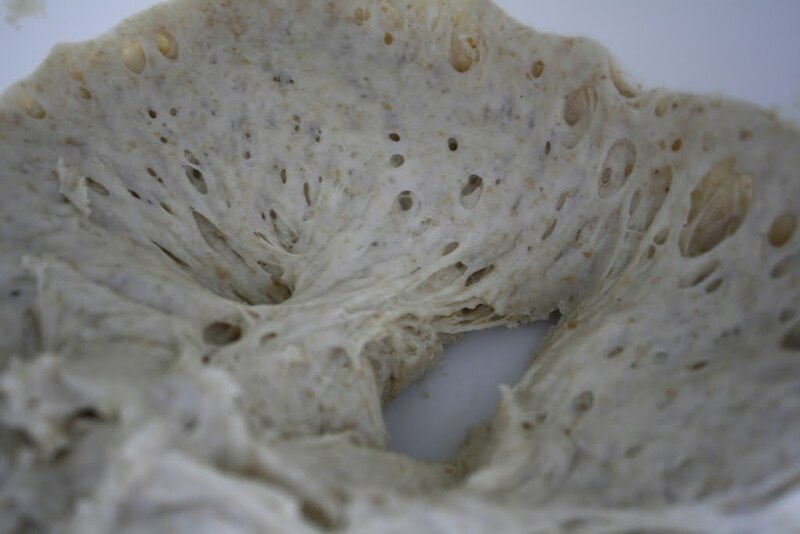 The physical action is different but it has the same effect on the dough: it gets stretched and tightens again. Much more wholewheat flour added to the mix in this recipe. 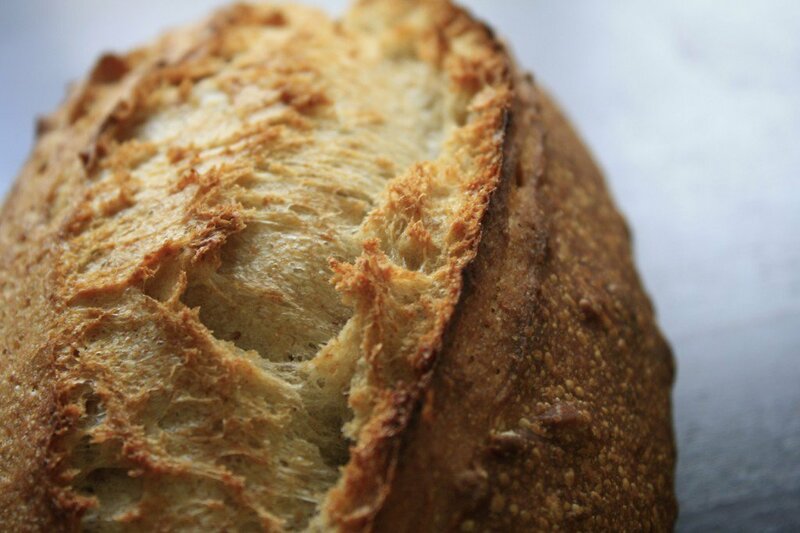 The classic pain au levain from “BREAD” contains only 5% wholegrain flour. A section of the refreshed stiff levain. The bâtards ready to be proofed on a couche. watch out though, this brings the preferment to 150gr in total but you’ll only need 125gr for the final build. I’ve been confused by the ratios and the metric weights in this book a lot, and there’s never a summary on the builds, which is quite irritating. I assume Leader always pinches a bit off his preferment to keep for the next baking session. Although I’ve seen “discard the rest” a lot… That’s just stupid, I’ll need to rearrange this. Anyway, it’s a 50% hydratation starter with 5% wholewheat. Remarks: 24% wholewheat (baker’s percentage! ), 70% hydratation, 25% preferment present in the final build. That’s more than usual for a “pain au levain” recipe, and I like it that way. 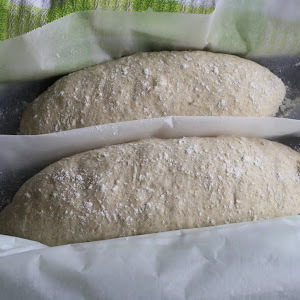 Bulk fermentation: 3-4 hours including 1 stretch & fold after 1 hour. Final proofing: 1 hour. Can you spot the yeasted and the levain versions? A section look at the crumb. 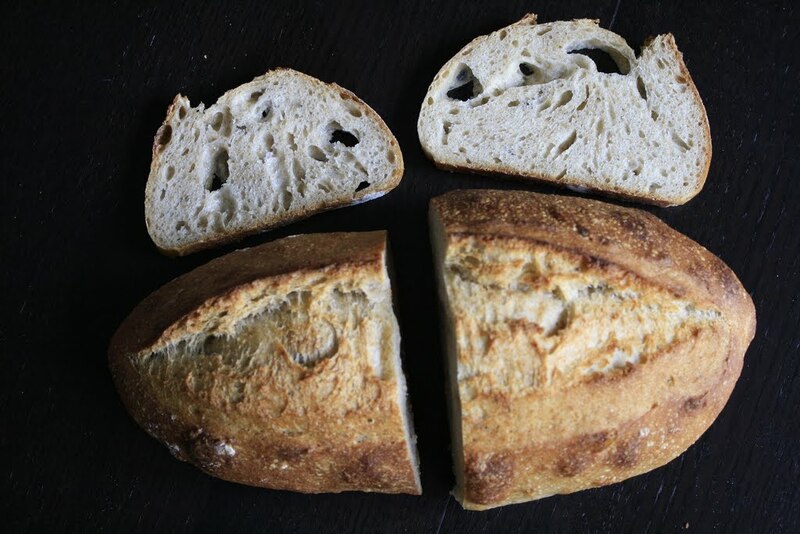 Left: levain, right: yeasted. I’ve also made some yeasted straight loaves, also shaped as bâtards because I wanted to practice the shape. 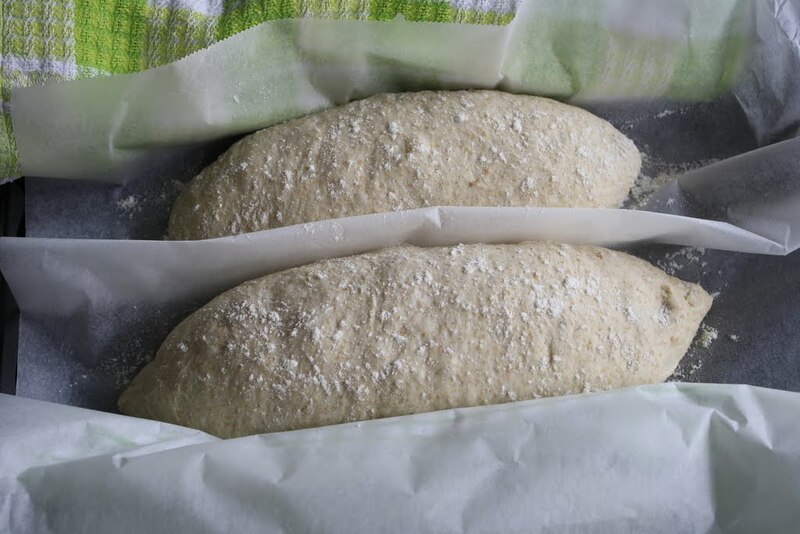 The yeasted version was made with about 40% wholewheat flour (500gr in total for 2 loaves), without any rye. 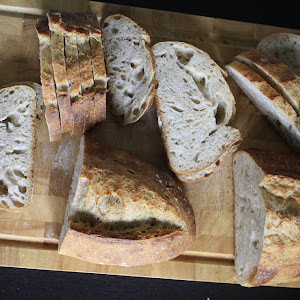 It took me 4 hours from start to finish but they came out a bit tasteless compared to the amazingly mild and pleasant taste the pain au levain has. Can you spot the yeasted version on the pictures above? Yes indeed they also have a lot of nice holes! Great, isn’t it? That’s because of the high percentage of water (70%) and the nice score. What did I do different this time? This: a compressed mister which can release water in a wider angle and at a higher speed using air pressure. This reduces the need to open the oven again and re-mist the sides of the oven because in a conventional oven, steam evaporates too quickly. You could also use lava rocks or a cast-iron skillet with some ice cubes, but the latter could be quite dangerous. Also, if you’re baking on a sheet pan, the skillet should be placed at the same level otherwise the sheet pan blocks the steam from reaching the bread!